Flour is particularly problematic because the usual ways of measuring it are notoriously unreliable. If you scoop the flour straight out of the bag with the measuring cup, you'll wind up with more flour in your cup than if you spoon it from the bag into the cup. Also, sifted flour has more air in it, so there's less flour in a cup of sifted flour. With all these variables, a so-called "cup" of flour could contain anywhere between 100 and 150 grams. So much for precision. In other areas of the culinary arts, this degree of precision is less important. A recipe doesn't fail or succeed because you used 27 green beans rather than 30. But with baking, you're not just dealing with recipes—you're working with formulas. Commercial bakers use weights for all the ingredients in their recipes, including eggs, butter, sugar, salt, and even baking powder and baking soda. At home, where we don't deal in large quantities, there's no reason to weigh the salt or baking powder—the amounts are too tiny. Teaspoons and tablespoons are fine for that. But when it comes to flour, using too much or too little can really affect the recipe, so at the very least, you should weigh your flour. And that means you're going to want to get yourself a digital scale that can be set to grams, and preferably one with what's called a "tare" setting, which lets you put a bowl on the scale and then zero it out. The one we use was about 12 bucks. The main thing you need to know is that a cup of all-purpose flour weighs 125 to 130 grams. 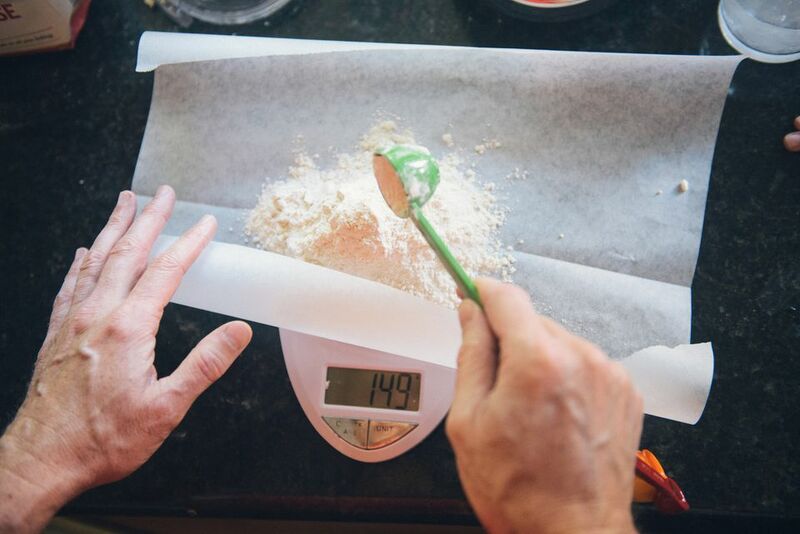 The exact weight will differ across different brands of flour, but if you use 130 grams you'll be all right. So when the recipe calls for a cup of flour, just weigh out 130 grams and you'll be all set. Did you ever bake cookies where the recipe called for a cup (or some other amount) of "packed" brown sugar? Did you ever wonder why it needed to be packed? And most crucially, did you ever wonder if you were packing it enough? Brown sugar is full of little air pockets, formed because the granules are coated with molasses, which causes them to stick together in all sorts of uneven ways. Packing the brown sugar squeezes out the air so that a cup of brown sugar actually contains a cup of sugar. Or that's the idea. The reality is that no one "packs" their brown sugar exactly the same way, making it one of the most commonly mismeasured ingredients. This in turn can affect not only how sweet your cookies are, but also their texture; how chewy they are; it can even cause them to spread too much (or too little). The solution: Weigh your brown sugar! A cup of "packed" brown sugar weighs 200 grams. So from now on, simply weigh out 200 grams (or fraction thereof for 1/2 cup, 1/4 cup and so on) of brown sugar, and you don't even have to bother packing it. Air weighs nothing, so 200 grams of brown sugar will always be the same amount, packed or not.